The Handwriting Without Tears preschool program is beloved the world over for its ability to remind teachers and students that the written word can be a delight. That’s why we’ve adopted the program as part of our curriculum at School for Amazing Kids. When learning is this enjoyable, everybody wins. Recent studies link the practice of writing by hand to improved creative writing and fine motor skills. 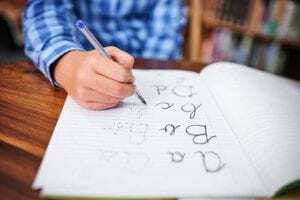 Elementary school students who are taught the art of handwriting are faster and more prolific than those who type, too. It’s with that research in mind that the Handwriting Without Tears curriculum was created. There are a number reasons why Handwriting Without Tears (HWT) is such a success for kids in grades K-5. We’ve witnessed first hand the impressive strides children make thanks to the HWT program. From increased confidence to freer expression to improved test scores, productivity and overall academic performance, our little stars do better thanks to this stress-free training. The right curriculum teaches kids that learning isn’t just easy, it can also be fun. Give your kids an educational edge with Handwriting Without Tears and other cutting-edge programs offered at the School for Amazing Kids. Schedule your tour to meet our talented instructors and see our incredible facility in person. I love our daycare. They have amazing customer service and always work with us if I have questions or concerns. I’ve never come in and feel like the staff is unhappy to be there. This place has been a gift to us.